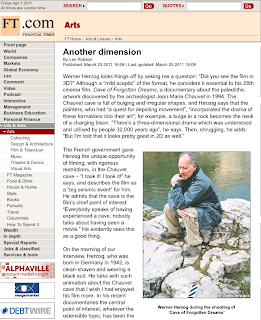 The French government gave Herzog the unique opportunity of filming, with rigorous restrictions, in the Chauvet cave – “I took it! I took it!” he says, and describes the film as a “big seismic event” for him. He admits that the cave is the film’s chief point of interest: “Everybody speaks of having experienced a cave, nobody talks about having seen a movie.” He evidently sees this as a good thing. On the morning of our interview, Herzog, who was born in Germany in 1942, is clean-shaven and wearing a black suit. He talks with such animation about the Chauvet cave that I wish I had enjoyed his film more. In his recent documentaries the central point of interest, whatever the ostensible topic, has been the human subjects, usually dreamers and fantasists or the subjects of fantasy – the Dalai Lama in Wheel of Time; Timothy Treadwell, the bear-lover killed by a bear, in Grizzly Man, Graham Dorrington, the aeronautical engineer trying to fly a dirigible over the Guyanan rainforest in The White Diamond. There are two engaging “experimental archeologists” in Cave of Forgotten Dreams, one of whom repeatedly – and ineptly – throws spears, the other of whom plays “The Star-Spangled Banner” on an imitation paleolithic pipe. But the striving, stargazing characters who really fascinate Herzog have been dead for 30,000 years. The film contains moments of extraordinary beauty but provides little in the way of human interest or drama. 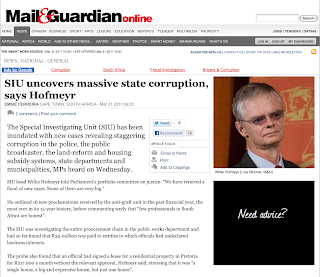 Read the rest and the original article here. Our next workshop is on sound editing with Andrew Spitz (Sound Designer) and he will be talking us through picture editor and sound editor relationships, editing choices that impact sound design and deliverables for sound. A workshop not to be missed! 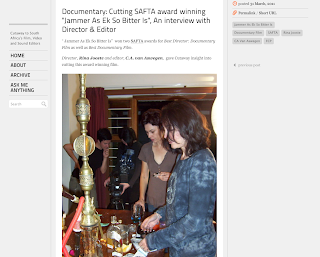 Jammer As Ek So Bitter Is won two SAFTA awards for Best Director: Documentary Film as well as Best Documentary Film. 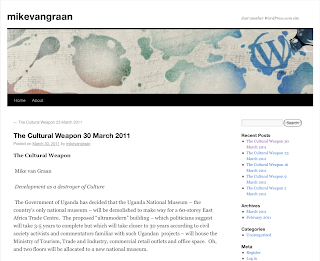 Director, Rina Jooste, and editor, C.A. van Aswegen, gave Cutaway insight into cutting this award winning film. CA: I think the biggest challenge for editing documentary, is that you are essentially writing the script as you cut. There is no real predetermined structure or script. No solid guidelines or parameters as one would have in drama or film. This would be the most unique aspect of editing documentaries. RINA: I see a documentary film as a work in progress, I don't use a script but do have a very focused and fleshed out treatment and shot list before I start shooting. I also do very thorough research to inform my story/content and do very thorough planning for the interviews and know exactly what content I need to come out of the interviews (an art in itself). I try to spend as much time as possible with characters beforehand as well, part of research and to become familiar with characters in order to get better interviews and footage. The more comfortable characters are with me, the better quality content we get. After filming, we end up with lots of footage that then has to be condensed into a story, without a script. This is not an easy task and we work with real life charactes and situations, it's reality and cannot be faked, although one does use manupilation of characters from time to time. We always have to keep in mind: our characters vs our viewers vs our aim/objective of telling the story, keeping all these elements in mind makes it a complex, but interesting task. 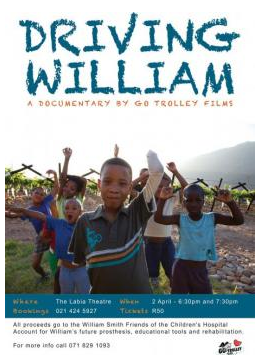 The documentary ‘Driving William’ will be screened at the Labia Theatre on 2 April as a fundraiser for William Smith, a local boy in dire need of prosthetic arms. Why would a 12-year-old boy climb up a high voltage power pylon? If you’re a curious William Smith who has a fascination with birds, the answer is: to retrieve a nest. Reaching up for that nest is the last thing William remembers before regaining consciousness at The Red Cross Children’s Hospital in Cape Town. William's severe electrocution resulted in a double arm amputation and 4 months in the Red Cross Burns Unit undergoing intensive rehabilitation. It was also an important period of redefining himself and adapting to a life without arms. "William is the bravest and most determined child I have ever worked with!' says Sascha Archer, art therapist at Red Cross. `William's recovery has been miraculous. He paints and writes with his mouth and feet, has learnt to swim like a dolphin in the Red Cross pool, plays music with his feet, takes photographic self-portraits with his chin, has learnt to speak fluent English and has mastered using a laptop with a pen in his mouth." Sascha, looking for ways to give William a voice to help him express what he has endured and overcome, met with filmmaker Jo Higgs from Go Trolley Films. Jo agreed to make a documentary after meeting William who she describes as, "an extraordinary young man with an exuberant sense of humor," Go Trolley films captures the struggles, accomplishments and joys of William's rehabilitation in addition to visiting his home, meeting friends and family in a rural grape growing district. The documentary is now complete and has been titled `Driving William'. Members of the public are invited to watch William's inspirational journey at a screening of `Driving William' at the Labia Theater on Saturday 2 April. The screenings will be used to raise funds for William's future prosthesis and additionally the movie will be used as a motivational tool in hospitals like Red Cross to inspire and give hope to future amputee and burns patients. All proceeds from the screenings go into the William Smith Friends of the Children's Hospital Account set up by Sascha, and goes toward future prosthesis, educational tools and rehabilitation for William. Our environment shapes who we are, we shape it. We occupy its space, it occupies us. The 8 best films will be chosen by a selection panel appointed by the Documentary Filmmakers Association (DFA). These 8 films will screen at the Waterfront Nu Metro Cinema as part of the Encounters Documentary Film Festival (as pre-main feature shorts). 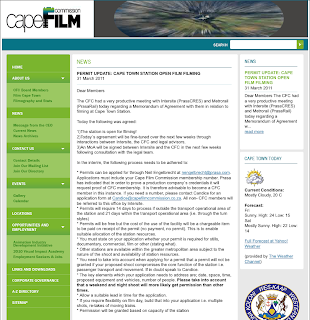 The 13th Encounters South African International Documentary Festival will be held in Cape Town and in Johannesburg from the 9th to the 26th of June 2011. One film will be selected as an overall winner by a panel of judges comprising of film as well as arts and broadcast practitioners. 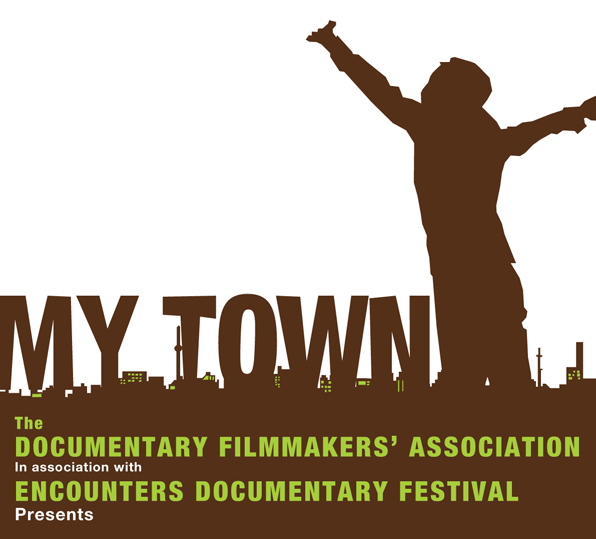 The winner will be announced at a function during the Encounters Documentary Festival in Cape Town. Prizes to be announced will include cash and filmmaking support. The winning filmmaker will be awarded a place in the NATIONAL FILM AND VIDEO FOUNDATION SPARK programme. The winner will be enrolled in this course, with tutition, travel and accommodation to and from the workshops will be funded by the foundation. Films will be produced at your own expense. The films produced remain the property of the filmmakers. The DFA will endeavour to negotiate broadcast and festival screenings with the filmmakers’ permission. Selected filmmakers will benefit from on-screen credits and general media exposure through the project. All filmmakers who enter a film will receive a year’s free membership to the Documentary Filmmakers Association (July 2011 – June 2012).